This plan is for a full two car garage that is extra long at 30´ and because it has a steep 12/12 pitch roof it has a huge upper floor that can be used for a shop, bonus room, hobby area, or a rental apartment. Access to the loft is an "L" shaped stair. Both upper and main floors are illuminated with natural light from windows. You can build this garage or you can hire a contractor to build it. Collector cars, farm equipment, work shop, wood shop, or just keeping the family cars out of the weather, what ever reason you need the space, this plan will work for you. This is a full plan set for a truss roof version meant to be used for costing, planning, choosing contractors, ordering materials, obtaining a permit, and building the extra space on your property. This plan is a good example of the quality and completeness of our other plans that we sell. The free plan is specially formatted for 8-1/2" x 11" sheets so that an ordinary personal printer can be used to print. An extended plan option which includes two framed roof versions is available. To download this free plan you must first provide your name and email in the form below so that we can send it to you. 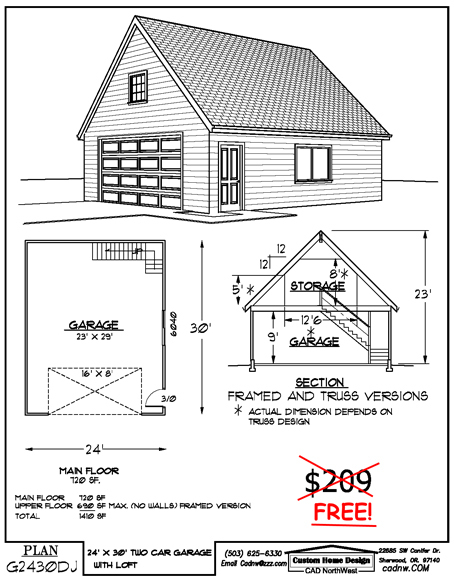 To receive the free garage plan, please fill in your name and email address and then press submit. Not only will you receive the free 24´ x 30´ truss roof garage plan, but you will receive updates when we add new plans or have created another free offer. We absolutely do not share your information with any other group, business, or organization. You will not receive spam from us.